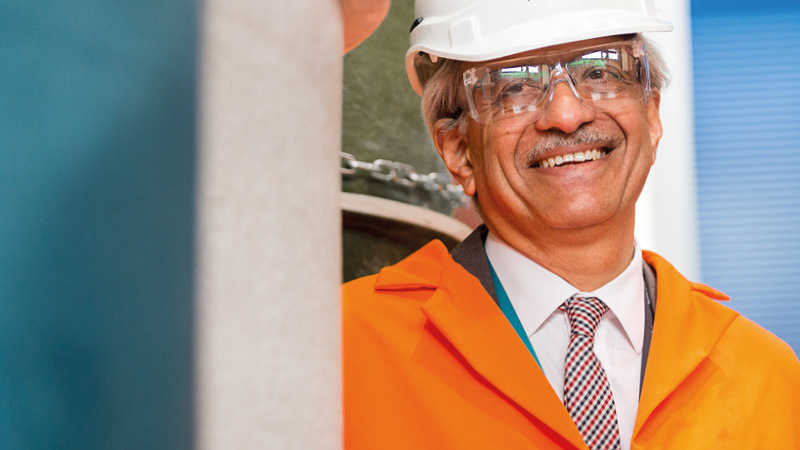 After 37 years working for our nuclear business, technology director Nawal Prinja continues to look forward. Fortunately, research is one of our strengths. When the UK government wanted to create a new high-temperature facility to test materials for use in future reactors, it selected us and gave us £2 million to host it. More government money is being invested on research into digital reactor design and new technologies for decommissioning. And there is increasing emphasis on research and technology development: the UK Government intends to increase its R&D spending to 2.4% of GDP, taking it to around £12.5 billion by 2021/22. Nawal is well placed to know whether a technology is truly ahead of the curve, thanks to three professorships at Aberdeen, Bolton and Brunel. These give him access to meetings of the Joint Nuclear Centres for Doctoral Training, where scores of PhD students present their work. It helps that he is an expert assessor for Innovate UK and also advises the Engineering and Physical Sciences Research Council, the International Atomic Energy Agency and the World Nuclear Association. The UK’s National Grid believes that nuclear will have to supply 31% of the country’s electricity needs by 2050. Undoubtedly, the existential challenge for nuclear power is to come up with the next generation of reactor design with greater thermal efficiency and lower build costs than current gigawatt reactors. This was borne out last year when our team, working with Rolls-Royce on small modular reactors, rapidly increased to more than 50 people at its peak, providing support on design concepts, early stages of safety cases, plant performance, fuel route, control and instrumentation, containment building concepts, and reactor designs. Between our ongoing services for nuclear energy in the UK, support for the ITER fusion project in France, our global decommissioning work, our leading position in wind energy and the long-term efforts to create a more sustainable future in conventional methods we have a significant stake in our global energy production, it’s an exciting place to be.